The horticulturalist John Lindley (1799-1865) worked for Sir Joseph Banks, and was later instrumental in saving the Royal Horticultural Society from financial disaster. He was a prolific author of works for gardening practitioners but also for a non-specialist readership, and many of his books have been reissued in this series. The first volume of this two-volume work was published in 1834, and the second in 1837. 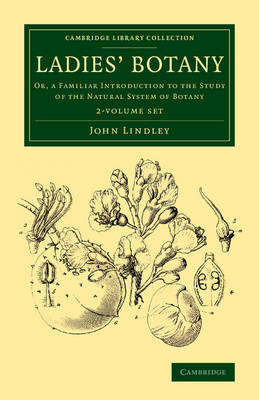 At a time when botany was regarded as the only science suitable for study by women and girls, Lindley felt that there was a lack of books for 'those who would become acquainted with Botany as an amusement and a relaxation', and attempted to meet this need. A vigorous opponent of the Linnaean system of nomenclature, he supported the 'natural' system of Jussieu, and in this work, designed to help ladies educate their children, he deliberately restricts the use of Latin terms.